From one-page informational websites to fully-integrated sites with special features, we work with you to provide a customized website solution that best fits your brand and requirements. From start to finish Studio 78 asks the critical questions in order to create a website with the best user experience for your audience. With our dedication to providing a quality experience, we offer solutions beyond website development. Whether you need to host on a server with high security or have a worry-free way to keep your website maintained and up-to-date, Studio 78 is the partner you want to turn to. Take a look at some of our features below! 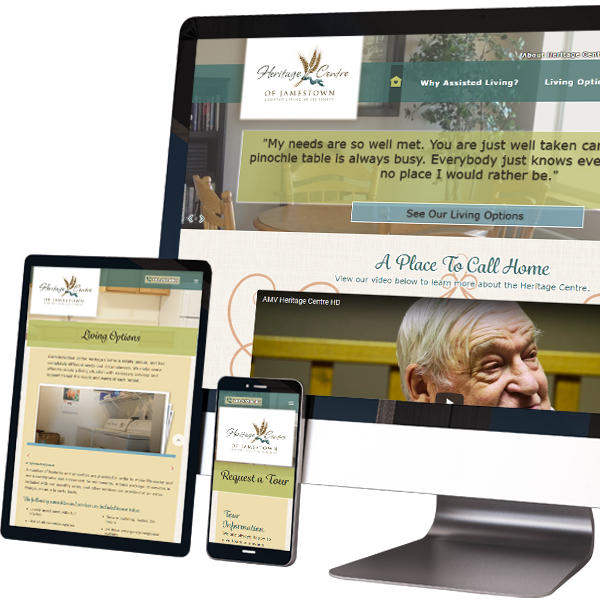 Utilizing the latest technologies and best practices we design responsive website layouts that will adapt and look great on any device. We don’t use templates, so you get a truly custom website that is unique. Our web design and coding meets criteria for accessibility so everyone can have access to your website. Custom CMS solutions are the answer when you want to manage your own web content. We utilize Concrete5, a robust, user-friendly, and secure CMS. Once we develop the framework we provide training so you can easily edit text, add/remove photos, and add/delete pages. You are in control, but we are here when you need us. Studio 78 is committed to building accessible websites so that everyone can access them, even those with disabilities that need to use different technologies to navigate through a site. We have teamed up with third party accessibility experts to provide you with an independent audit of your website to assure accessibility compliance. Not only do we know it is good for our clients and their customers, but it is the right thing to do. Studio 78 has numerous clients in the banking, credit union, healthcare and long term care industries and we have developed security-focused procedures and products to meet the requirements of these heavily-regulated industries. All of our clients enjoy the benefits of our secure hosting solutions including IT Penetration Testing due diligence, secure online forms, and much more. Keeping your content fresh is important in sharing information with your clients and customers. Studio 78 utilizes a user-friendly client portal making it quick and easy to submit all types of additions or changes to your website. With access to an extensive library of photography and artwork, our expert designers can create high-impact graphics to enhance any marketing initiative you have. The secure portal tracks the progress of your request and you can simply log in to see how close your request is to completion. This system provides a more efficient and effective way for our team to monitor and complete requests in a timely manner. It also gives client the ability to see more information on projects, requests, or packages with multiple search functions to filter through the past or present data. We know what it takes to make a website work and will handle all of the details! We can secure or manage your domain and accommodate your hosting needs, whether simple or complex. Studio 78 is partnered with a first-class web host provider, Liquid Web, who is secure, reliable and fast. Need an SSAE 16 Report? It’s available free of charge to all of our hosted clients. Reliable email services are critical for communication to your customers as well as within your organization, so Studio 78 has partnered with Microsoft to offer Hosted Exchange services. Get business-class email as either a standalone Exchange Online plan or as part of an Office 365 Business plan that includes Office and more. Make user security a worry-free experience when you host your site with us by purchasing a Domain, Organizational, or Extended Security Ceritificate. We will facilitate vetting, maintenance, and renewal of your domain’s SSL certification. We are committed to using search engine optimization best practices when building and maintaining your website. Through use of keywords, code, and other proven methods, we help your site rank better organically in the search engines. We can also evaluate and provide future SEO strategies upon request.